ADAC 5.01 will save your council significant costs in the time it takes to manage incorrect, missing or redundant data. The time spent by systems officers managing this ongoing issue for councils can then be spent on tasks that deliver council’s strategic outcomes. ADAC (Asset Design as Constructed) is a non-proprietary data specification and transport format (XML) for the description and transmission of asset design and as constructed data. ADAC is available at no cost however we encourage you to join as a subscriber for an opportunity to influence the ongoing development, governance and expansion of the specification. Subscribers also receive access to documents, tools and materials developed to support ADAC implementation and an opportunity to shape the strategic direction of ADAC in conjunction with BIM. We have a panel of skilled providers to assist you with the implementation of ADAC. Note: apply a 10% discount for subscribers to PWTS. Please contact David should you have any inquiries regarding ADAC. 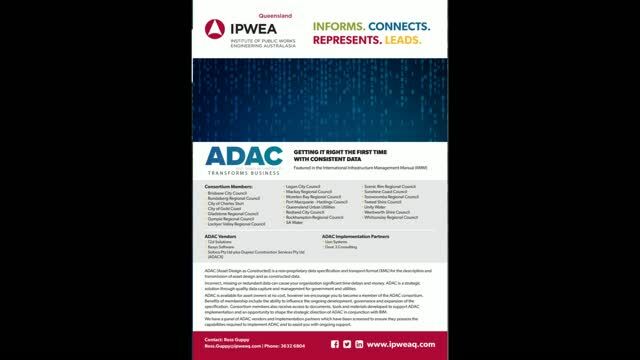 Would you like to receive ADAC - IPWEAQ's free Schema? Thank you for your interest in the ADAC consortium. We will revert to you shortly.